Customize your trip with a local travel expert. The Southern Lights can be seen from southern Australia, New Zealand and southern Argentina. While most people have heard of the Northern Lights, few realize that the South has its own magnificent light display. The Southern Lights appear over Australia, New Zealand, Chile, Argentina and Antarctica, producing rainbow skies and bright, shifting ribbons of light. These light displays are rare, and only visible from remote locations. However, with some planning, the right information and a lot of luck, it is possible that you could tick the Southern Lights off your bucket list. Aurora australis, also referred to as the Southern Lights, occur as a result of fierce solar storms, which send solar winds rushing towards Earth. When the winds reach the Earth’s magnetic field, they trigger reactions with gases such as oxygen and nitrogen and create photons or tiny explosions of light. From these light explosions, thousands of vivid colours can be formed in the sky. The Southern Lights rarely seem colourful to the naked eye. This is because humans struggle to see colours at night. Instead, they might look like a white or grey glow shifting and transforming on the horizon. But this doesn’t mean the colours are not there; with a camera, you can capture their true beauty. The lights look incredible in a photo, appearing as streaks of pale green, blue, yellow and lilac across the sky, or dramatic streams of light on a backdrop of twinkling stars. Many places where the Southern Lights can be seen are far-flung and definitely not typical holiday destinations. 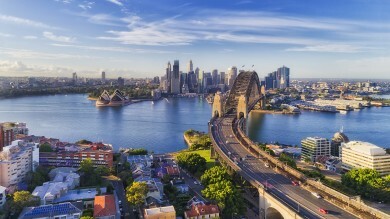 However, there are a handful of locations a bit closer within reach—in southern Australia, Tasmania and on New Zealand’s South Island. Keep in mind, however, that travelling somewhere with the sole aim of seeing the Southern Lights can be futile. To avoid disappointment, go to see the destination instead — and perhaps the lights will be a thrilling bonus. Head to Australia’s wild south coast to see aurora australis. 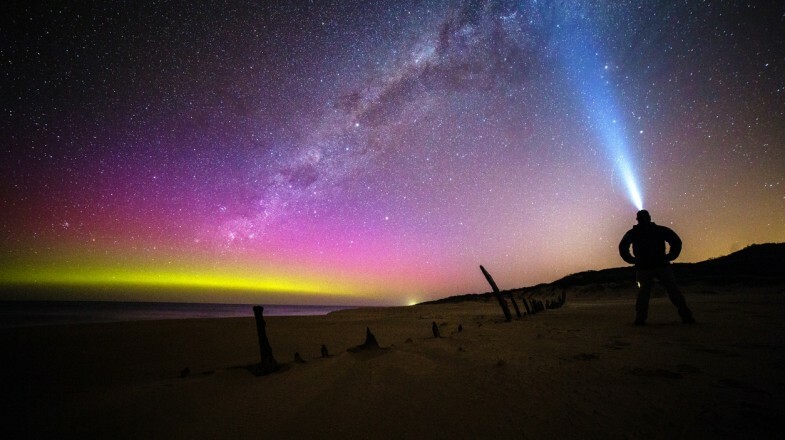 Full of empty, south-facing beaches, photographers have captured auroras from the Gippsland Coast, the Bass Coast, Phillip Island, the Mornington Peninsula and the Bellarine Peninsula. These places all have one thing in common, a crucial clear view towards the ocean. Then, when you are not ‘aurora chasing’, the south coast has plenty going on—especially for hikers, wine lovers and foodies. 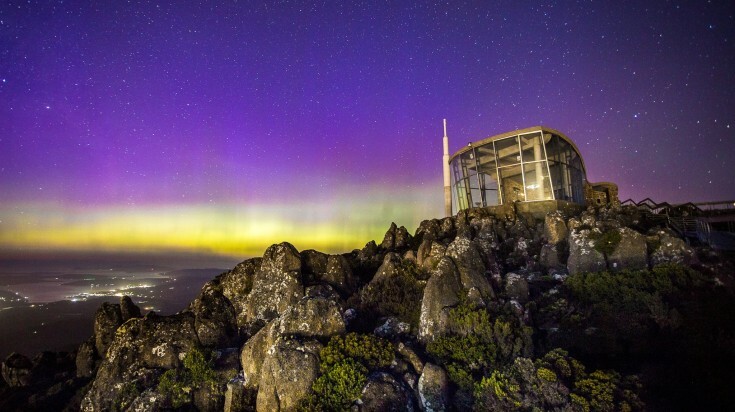 The Southern Lights have been spotted all over the island of Tasmania and especially around the capital city Hobart. East of the capital lies a collection of unspoiled islands and peninsulas with quiet, south-facing bays that are ideal for seeing auroras. Bruny Island, Satellite Island, Betsey Island and South Arm are all popular spots. There is no light pollution here at all and it is so undeveloped that you will likely have just penguins for company. The website Aurora Australis Tasmania has a map of locations and more information on spotting auroras in Tasmania. Aurora australis seen above Hobart, Tasmania. New Zealand is another destination where you can, on occasion, catch a southern light display. Auroras have been photographed on the South Island of New Zealand in places such as Dunedin, Queenstown and Invercargill. East of Dunedin, the rugged Otago Peninsula has several popular viewpoints, including Sandfly Bay, where you’ll share the view with sea lions and seals. In Mackenzie, the Aoraki Mackenzie International Dark Sky Reserve has some of the most perfectly clear skies in the world, as well as the Mount John Observatory, and is accessible by road. On the south coast, Awarua Bay is another spot popular with locals. 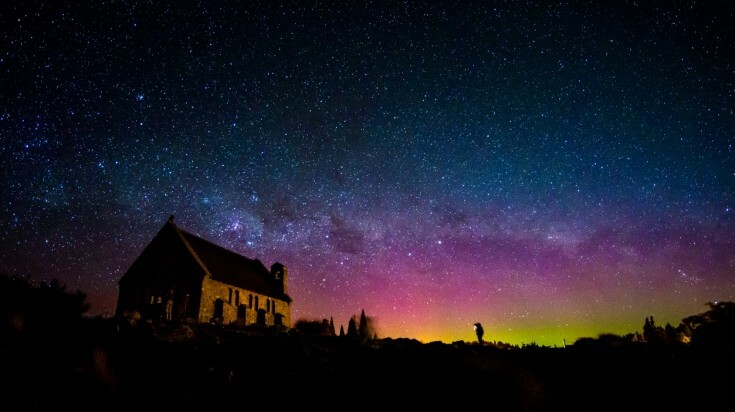 The Southern Lights as seen over the Church of Good Shepherd, South Island in New Zealand. Recently designated a Dark Sky Sanctuary, the third largest island of New Zealand, Stewart Island is even closer to the South Pole than South Island. Barely inhabited, it has only 42 street lights and is hoping its outstanding dark skies will attract aurora tourists. When not looking for the lights, there is plenty to do in this exquisite wilderness, including bird watching, fishing, diving and kayaking. There are, of course, other places in the world where you can see the Southern Lights, including South Georgia Island, Macquarie Island, the Falklands and distant parts of Argentina such as Ushuaia — but in winter (June to August), most of these destinations are either inaccessible or reserved for serious adventurers. And although you might think that Antarctica would be the best place to see the Southern Lights, in fact, most Antarctic cruise ships do not venture far enough South to catch a glimpse of them. As many hours of darkness as possible: The longer it stays dark, the more chance there is of seeing the lights. Winter is the best season, as the days are at their shortest. A moonless night: While experienced photographers might be able to work with moonlight, for beginners, a bright moonlit night can obscure an aurora, so the darker the night, the better. Clear skies: Low-level clouds will obscure the lights. The best chance of seeing them is on a cloudless night. The Southern Lights are unpredictable and can appear any time of the year. Want to find out when this mysterious phenomenon is likely to appear? You can check website forecasts, download apps which will send the information to your phone, check social media or, if you are already at the location in question, ask local residents for advice. Several websites predict the likelihood of aurora australis appearing and how visible they will be. In Australia, the Bureau of Meteorology issues an aurora watch bulletin. 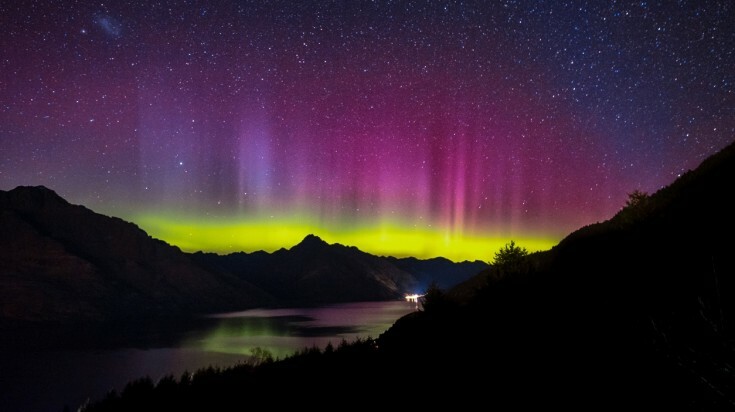 In New Zealand, the University of Otago maintains an aurora prediction website. The website Aurora Service provides detailed information on solar activity and auroras at both poles. There are several apps giving information about solar activity and the likelihood of seeing an aurora. These include Star Walk and My Aurora Forecast and Alerts. One of the best ways to find out what is going on in the sky is to join a local Facebook group. Run by enthusiasts, these are great places to connect with local aurora chasers for forecasts, photography tips, and more. In Tasmania, Aurora Australis Tasmania is the most active group, and in New Zealand, Aurora Australis – New Zealand is another popular group. If you want to return home with a great multi-colour image of the Southern Lights, you will need to get out your camera and practice. You are unlikely to get good shots using a camera phone, but you don't need expensive equipment — a basic DSLR and tripod will be fine. And while you don’t need to be a professional, these hacks and tips will help you get the most out of the experience. Switch your camera to manual focus, otherwise, it won’t be able to focus on the lights. You need a fast shutter speed (no longer than 30 seconds) so adjust your camera to a large aperture (f4, 3.5 or 2.8) and a high ISO (800–1600 or higher). A wide-angle lens will ensure you get as much of the aurora in your shot as possible. Take a good tripod for the camera to ensure steady images. Choose a remote location and face away from any city or town to avoid light pollution. A clear horizon with no buildings or mountains in the way will vastly improve your chances of getting a good shot. Stay safe and warm. You will probably be waiting in the cold and dark for quite a long time, so ensure you have warm clothes, a headlamp and spare batteries. If possible, scout out your location during the daytime. The trend for dark sky tourism and the creation of new dark sky reserves and observatories means it is getting easier to see natural phenomena like the aurora australis without having to trek into an icy wilderness. So, whether you are a budding aurora chaser, photographer or just happen to be in the right place at the right time – why not join in and have a go at capturing the beautiful experience for yourself?